Getting the right furniture for your living room is essential. The priorities are different for each individual. Some value comfort, others quality and some are most concerned with the style of their pieces. Thankfully after our reading our Eames Lounge Chair Review guide you will learn that this chair truly excels at all of these factors. Whatever your preference we turn to furniture designers and manufacturers to see what they have on offer. These experts in the field combine multiple elements to create the furniture we’re proud to have sitting in our living rooms. Occasionally designers create something which really stands out. A piece that becomes iconic and makes a big impact on the world. The Barcalounger was one of the first to do it, but the Eames lounge chair is one of these that remains as desirable today as it was when first released. The Eames brothers originally designed the furniture as a luxury piece of furniture that brought value to the customer. Nowadays it’s a high end luxury piece that is sought after by many and the Eames lounge chair is synonymous with relaxation. If you are have made the plunge in purchasing an Eames chair, you'll be reaping the benefits! I can come home after a hard days work, and take the best nap in this chair. Check out other recliners and chairs for sleeping. Charles and Ray Eames were furniture designers who worked for Herman Miller Furniture company. They were focused on producing good quality furniture that was easy to mass produce, making it easy to create and distribute to a large customer base. The Eames lounge chair was the exception to this. Designed to be a luxury unit on the high end unit that offered comfort, support and relaxation at a high end price. They sought to improve the existing lounge chairs and make something uniquely beneficial to the customer. 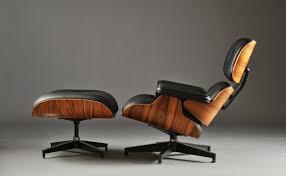 The Eames lounge chair came about while they were experimenting with molded plywood and leather. They sought to create a chair that was an escape point from a hectic life. A place that the owner could come to to relax and forget about the problems of the day. The Eames brothers stated that they wanted it to have a “warm, receptive look of a well-used first baseman's mitt." and it stuck. Now the iconic leather and plywood represents luxury comfort and is desired in homes across the country. The Eames lounge chair is made using plywood and leather to give a rich warm look. Leather is more durable than most fabrics and should mean it lasts longer than other chairs. There are over 50 different colours of leather available with everything from lights to darks. This lets you match it to your room and existing furnishings. There are also a number of veneers available to choose from. These both give distinctive looks and offer a unique feel to your chair. There are all black and all white options which are some of the most popular choices. The chair is also available in 2 different sizes so it can fit the space you have available. The ability to select between 2 different sizes really give you the best comfort possible. The combination of design choices and handmade quality make the Eames lounge chair really desirable. It’s built to be luxury furniture and that’s exactly what’s been offered for over 50 years. HermanMiller are still very well known for their lasting quality and reliability. The Eames chair is made by them almost exclusively and is built to last. They offer unparalleled craftsmanship with experts handling each stage. ● The best materials: only the most reliable materials including 7 ply veneers are used in the manufacture, ensuring a lasting quality. ● Individually upholstered cushions are used in their construction process. Behind the Eames chair is a long history of high quality furniture manufacture. This goes into every unit at Herman Miller and the result is a durable and resilient quality that lasts. 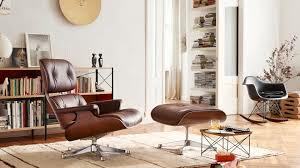 The Eames lounge chair is still produced by Herman Miller furniture and is one of their signature pieces. Across the world there are some other manufacturers who are licensed to produce the unique design. All of these are carefully vetted to ensure the highest build standards so there are no dips in quality. 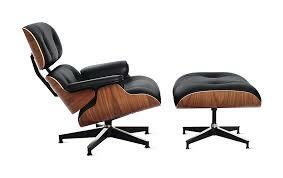 Because of the limited number of companies able to produce the Eames lounge chair the prices are inflated. This means it will cost at least a few thousand to own one, potentially more. This is a lot for those not used to purchasing high end furniture, and it can be a big decision to part with so much on one item. This has led to other companies creating similar knock off products, which don’t follow the original design. These are cheaper but of lower quality, which can mean disappointment for the customer. Overall it’s definitely worth saving up or waiting until you can afford the genuine article. You’ll get all the great features and a really impressive piece for your home. It’s a lot to spend but in the long run you’ll get a lot of use out of it. 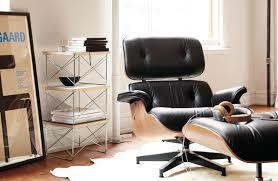 The Eames lounge chair is available through a number of retailers both in stores and online. The real question with pieces like this is, do they deserve the reputation they have. The Eames lounge chair undoubtedly does. 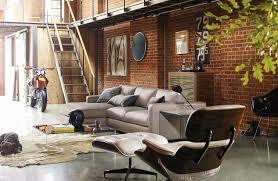 The design is stylish but comfortable, classy and elegant the leather and wood make any room more fashionable. The second question is, are they worth the large price tag that comes with them. That answer is less clear cut as people’s budgets vary greatly. All that can be said is that the chair is stylish, useful and well made. It adds a lot to a room and the imitation items just don’t do it justice. If you can afford an Eames lounge chair then you’re sure to get a lot of use out of it and you’ll likely be pleased with the purchase. It is a lot to pay but in the long run it could turn out to be a good investment in one of the most iconic furniture pieces. Overall I hope this Eames lounge chair review guide has done this piece justice. It is truly one of the most comfortable chairs, and in turn it carries a heft price, but if you value comfort and value then it is worth it! If you are interested in some chairs that are often thought of as "The most comfortable seat in the house" then I would check out Lane furniture as well. They offer recliners and sofas that are high quality and comfortable as well.